Enjoy an immersive entertainment experience that defies all your expectations. 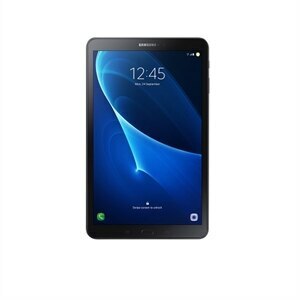 Whether you're at home or on the go, the 10.5-inch Samsung Galaxy Tab A gives you the best cinema and entertainment for the whole family right in the palm of your hand. In order to give you an even more immersive cinema-like viewing experience right at home, the new Galaxy Tab A provides a 10.5” display with minimized bezels. * Dolby Atmos also is functionally supported through headphones and Bluetooth speakers. Some sound effects may not be supported on other listening devices. ** Images simulated for illustrative purposes. Unplug and take the Galaxy Tab A with you. Its 7,300mAh battery lasts for up to 15 hours of video playback on one charge, and Fast Charging enables you to fully charge in a short 3.5 hours, so you can use it longer and wait less. Galaxy Tab A features an AP chipset and 3GB of RAM for high performance and low lag. It also comes with 32GB of internal storage space that can be expanded with a MicroSD for up to 400GB storage, giving you more room for even the larger HD films you love to watch. *Available storage may vary by country. **MicroSD card sold separately. ***Images simulated for illustrative purposes. Even while charging on the POGO stand, your tablet is always ready to use. Set it up to display one of three types of boards – daily news and information, a digital photo gallery, or as a control hub for your smart home devices. And with Smart Things, you can easily control all your smart devices right from your tablet. *Weather forecast feature requires a data connection. **POGO charging dock sold separately; daily board use requires POGO charging dock or Type C USB. ***Images simulated for illustrative purposes. ****Bixby voice will be supported via MR from 2019. *GPS must be enable to use Bixby Live Result. **Available functions and features may vary by country or region. ***Images simulated for illustrative purposes. With multi-user mode in Galaxy Tab A each member of the family gets to experience their own tablet. Create a separate account for up to eight extra users, who can then change and save settings according to their own unique preferences.